What are deuteromycetes—“imperfect fungi”—mentioned in many fungi classifications? In many classifications, if the reproductive, sexual spore of a fungus species has not been identified or examined, that fungus is placed in the phyla Deuteromycota. Imperfect fungi are also called deuteromycetes or conidial fungi. They are a collection of distinct fungal species known to reproduce only asexually; the reason for this special listing is that, to date, the sexual reproductive features—or even sexual reproduction—has not been seen in any of these fungi. Most imperfect fungi are thought to be ascomycetes that have lost the ability to reproduce sexually. Deuteromycetes are mostly free-living and terrestrial, but some are pathogenic—those fungi that affect humans and other animals. For example, pathogenic deuteromycetes include athlete’s foot (Epidermophyton floccosum) and ringworm (Microsporum canis). On the positive side, other famous deuteromycetes include Penicillium roquefortii and Penicillium camemberti—used to make Roquefort and Camembert cheeses, respectively. 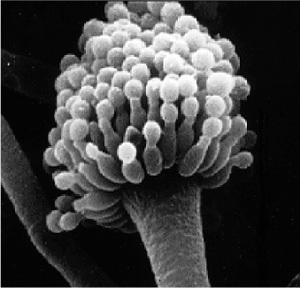 This aspergillus is one example of an imperfect fungus, or deuteromycete, a fungus that reproduces only asexually.